The Charlottesville riots are the result of a poor decision process by the Charlottesville City Council. The right-wing protestors, the left-wing counter-protesters, and the statements by the Mayor, President Trump, and many news reporters were reactions to a decision that did not reflect the consent of the governed. It is not a mayor’s job, the media’s job, or a political party’s job, not the president’s job, to tell a people what they should believe, do, or say. The people living in a town or city should have a right to choose monuments for themselves. 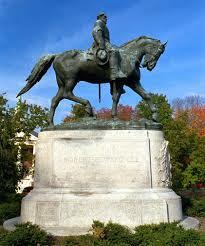 What does this statue mean to the citizens of Charlottesville? Slavery?—Maybe. Heroism?—Maybe. Group identity?—Maybe. Democracy?—Maybe. It means all of these things to some people and some of these things to others. The purpose of this article is to offer a principled and non-violent approach to determining the display of public monuments. Consistent with the principles of “the will of the people,” and “consent of the governed” a large majority of the people of a territory should approve the erection or removal of public art. A 51% majority is insufficient to qualify as “the will of the people,” and a minimum of 2/3 and perhaps 80% more properly represents the will of the people. Failing to achieve that amount of support public land should remain empty or we can expect the possibility of violence. Each generation, each community, and each social organization should be free to erect and remove monuments and public artwork that reflect their views. Not the views of elites, not the views of the media, not the views of a political party, not the views an ideological force or religion, but the views of the people. To do otherwise is a form of cultural oppression. The dead do have some power over the living. The previous generation gave the present generation a subconscious worldview through language, manners, behavior patterns, symbols, and ideas. However, Jefferson was referring not to the cultural influence of the past on the present, but of the legal right of a generation to live its own life the best it sees fit, with the consent of the governed. A village monument belongs to the village. It does not belong to a minority group living in the village, or the county or state in which that village resides. Following the principle of subsidiarity, each individual, family, or level of society should have a fundamental right to display artwork on its territory. A family should have the right to display a family crest or fly a family flag, a Christian Church should have the right to display a cross, a business, labor union, or political party its logo or flag. However, a village is a mixture families, ethnic groups, religions, and public monuments should not be imposed by any of these groups, nor by other levels of government on the village. A monument will only represent a village if it represents the general will of the villagers. No two people think the same. It is difficult to get agreement among people on many topics, especially public art, when “beauty is in the eye of the beholder.” So it is unlikely that any society would get 100% approval on any public action. However, it is clear that allowing the decisions of minorities or simple majorities prevail is devisive and sets the stage for public unrest and violence. In a society in which 51% favor abortion and 49% oppose it, if a law is passed to allow it 49% will believe that law to be illegitimate, and passing the law will breed unrest and possible violence. The U.S, Founders understood this problem and often recommended a supermajority 2/3 or 3/4 to represent the general will of a group. With more than an 80% majority there is historically little unrest, and very little policing is required. In the case of the Charlottesville statue the city council voted 3-2 to sell the statue. This was not a supermajority of the council, but a simple majority, and it certainly revealed little about the consent of a supermajority of the residents. Thus it was a process prone to violence and an example of a poor political process. When the council failed to get a supermajority, it would have been wise to hold a public referendum that required a supermajority. Simple majorities breed factionalism and are advocated by simple majorities. The “nuclear option” being in the U.S. Senate over healthcare is another example. Partisan politics would not be so bitter if supermajorities are required. If more than half the members of each party (75% supermajority) were required, no bill would pass unless it genuinely represented the will of the people. There would be a lot of gridlock, but that is exactly what the founders intended, nothing would pass unless it served the benefit of all. The political process that exists today is just the opposite, it allows special interests and simple majorities to serve themselves at the expense of the whole, rather than being a process that encourages only service to the whole. The Charlottesville monument controversy, like the Affordable Care Act, represents factionalism and violence aggravated by the degeneration of political processes in the United States. Both these incendiary issues resulted from laws passed with simple majorities and not a supermajority, undermining the legitimacy of the governance bodies that made such decisions. The news media fanned the flames, reporting on violence and promoting hysteria, while failing to report that political processes were largely responsible for the events. The fault does not lie with the Mayor of Charlottesville, Donald Trump, the alt-right or Antifa. Rather, these persons and groups contributed to the controversy and violence after the fact, by reacting superficially to one another rather than recognizing the idea that poor political processes were the original cause. This is a brilliant and much need analysis.